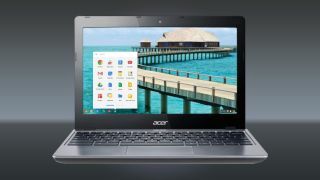 Acer aimed to balance specs and price when its C720 Chromebook landed back in December, and now the company has announced two beefed-up models for those seeking a step up in the power department. Both are available with Intel Core-i3 processors, which should provide a healthy performance boost over the original version's Celeron-flavoured chip. The lower-priced C720-3871, which sports 2GB RAM, enters the fray at $350 (around £204/AU$372) - around $150 more than the original C720, which still stands as one of the most affordable Chromebooks on the market. The more powerful C720-3404, which packs an Intel Core i3-40005U processor (1.7GHz, 3MB L3 Cache) and 4GB of memory, will set you back $380 (around £222 / AU$404). That processor brings the C720 closer to the power of the Chromebook Pixel, which remains the most powerful Chromebook on the market thanks to an Intel Core-i5 processor, and a wallet-thumping price tag to match (£1259 - around $2,184 or AU$2,327). Both of the new variants come with an 11.6-inch HD display toting a 1366x768 resolution and tote HD4400 integrated graphics. Connectivity options include 802.11 a/g/b/n Wi-Fi, HDMI and USB (2.0 and 3.0) ports, and they also get 32GB SSDs that allow the devices to wake up in an instant. Of the two, only the C720-3871 is currently listed on Amazon's US website. No word yet on global availability and pricing.